So today was a bit of a big day. First day back at work. 4am alarm call. New healthy eating regime (again). Restarting the exercise thing (again!). New boss (thankfully he's quite nice if you feed him cake - just not after midnight). 400-odd emails in my inbox after a two-week holiday (that excludes the fifty-odd I read and replied to whilst I was away, and I'm not even important!) A mountain of washing that still needs to be conquered. I had intended to make a low-fat turkey chilli for lunch, but then I realised I hadn't organised myself well enough for lunch at work (this was at 3.57am, just before the alarm call) so I decided to whack together a little prawn noodle salad, thus saving me from temptation at the salad bar in the canteen at lunchtime. Ordinarily, when I'm at my base site, I'll have a jacket potato and salad. Trouble is, salad is about the only thing they do well and I usually end up with pasta or rice salad and coleslaw and all manner of other lovely salads, covered in dressings crammed on to my plate, meaning that I'd probably have done better to have something else. But making my own instead, even if it meant cooking noodles before 5am, meant that I managed to stay relatively safe during day one. Despite eating lots of rubbish on holiday, lugging around a 15kg toddler meant that I came home 4lbs lighter than when I went. We walked several miles most days and this is a long way when you're only two. When you're thirty-five and carrying a two-year-old it seems even further. I now not only need to see a chiropractor about my hip pains (which keep interrupting my running) but also my bad back and neck from too many piggy backs. I'm keen to keep up the weight loss momentum so healthy eating and low-impact exercise will be replacing cake and toddler carrying for the next few months. The recipe today came from my Leiths Simple Cooking book. I adapted it based on what I had in my fridge and it worked quite well for a lunch box meal. The flavours were delicate, it was filling enough for me to miss out on my afternoon snack that the diet allows and it made me feel thoroughly virtuous. Definitely a diet make-again as it's less than 300 cals. Cook the noodles according to the packet instructions. Once cooked, drain then run under the cold tap. Cut the lime in two. Squeeze the juice of one half of the lime into a small bowl and stir in the nam pla, soy sauce, sugar, chilli, coriander and mint. 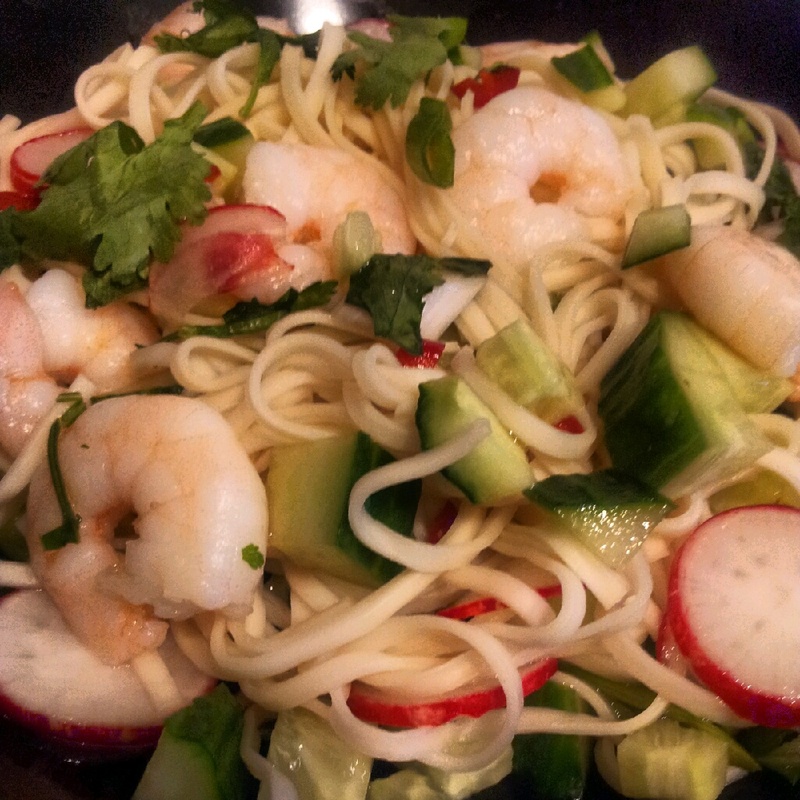 Mix the vegetables, prawns and noodles together then pour over the dressing. Squeeze the juice from the other half of the lime over the dish just before serving.